Dear friends, it has been so, so long since I’ve posted anything…ugh! I’m so disappointed in myself but believe me when I say tons of stuff has been happening around here. We’ve done major renos to our master bedroom. I will have lots around that project. I’ve also been dealing with annoying health issues that have slowed me down a bit. I have not even logged onto WordPress to read blogs that I follow! Let’s see, what else? Oh, I had a lovely trip to Croatia in August to celebrate my parents’ 50th anniversary and I adopted a senior siberian husky. Our resident dog (Shayla), also a siberian, is 11 years old and is taking some time to adjust to having a “new guy” around. My youngest has gone off to university and left Mr. and I with an empty nest. Life has been crazy but wonderful. 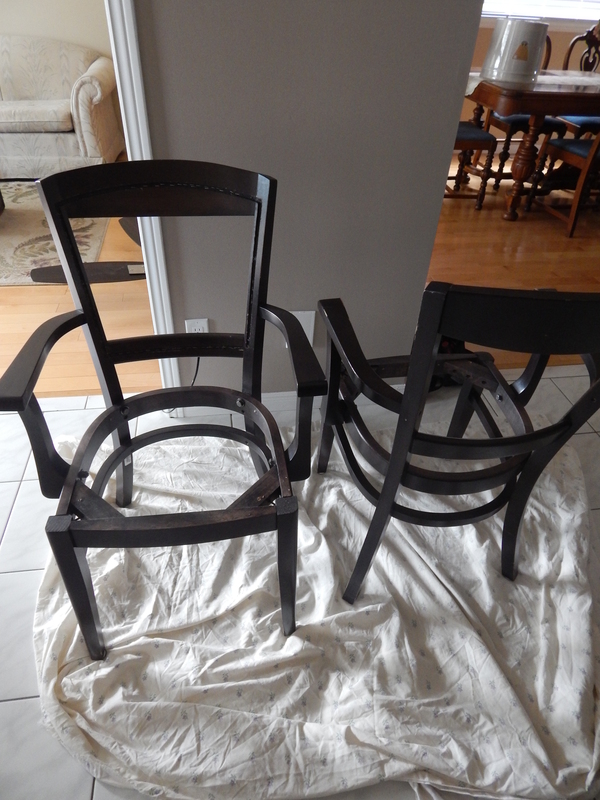 This is the story of a tired oak dining room set. My old high school friend Connie posted a pic on Facebook asking if anyone knew someone that would be able to stain her dining room a darker colour. I suggested she could DIY this and I’d help her but I ended up taking on the project. I am so happy that I was able to transform this set. Older pieces are so worth saving. You simply cannot buy this quality today in any of the big box stores. High end? Maybe, but who wants to spend tons of money on furniture. A nice vacation sounds better to me. Connie is just as funny as I remember her from all those years ago. I am so glad we connected again. Who knew that a DIY project could bring people together this way. She would not let me include a picture of her in this post but believe me, she is just as pretty and fun and funny as I remember. You know that one friend who is a little bit wild and and crazy (in a good way)? That’s her. I started by giving everything a light sanding to rough it up a bit so that the General Finishes Java Gel Stain would adhere properly. As well as some filling in where the veneer on the sides was starting to peel. 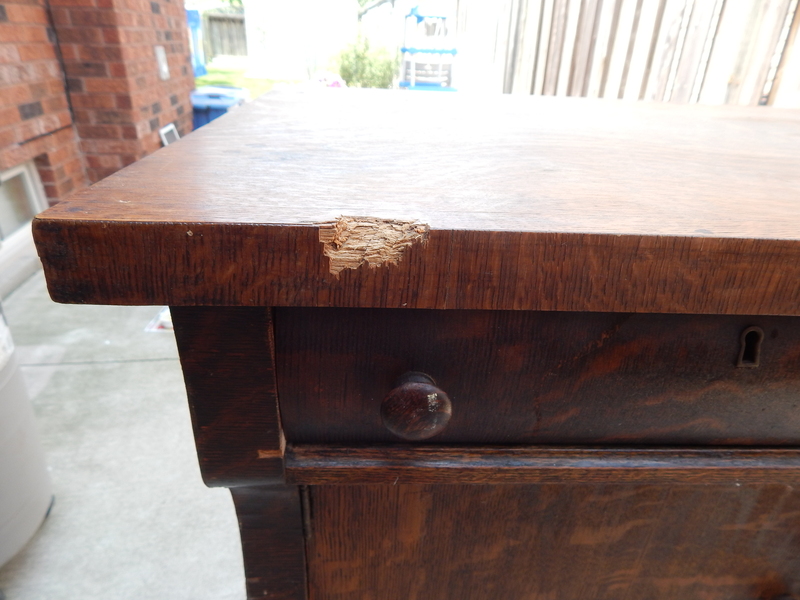 Incidentally, finding veneer on vintage or antique pieces is very common and not an indicator of poor craftsmanship. After one coat, looking pretty splotchy. This is quite normal. I was done. Four coats in total and then I noticed something. I hadn’t seen them when I was looking straight on but there were what appeared to be “bubbles” on the surface of the table. Argh! My level of frustration! I felt sooooo bad. I knew there was no way I could leave it like this. What was the cause? I’ve done countless projects with stain before. I couldn’t really “feel” anything with my fingers but it didn’t look right. It could only be from previously water damage. I had two choices. 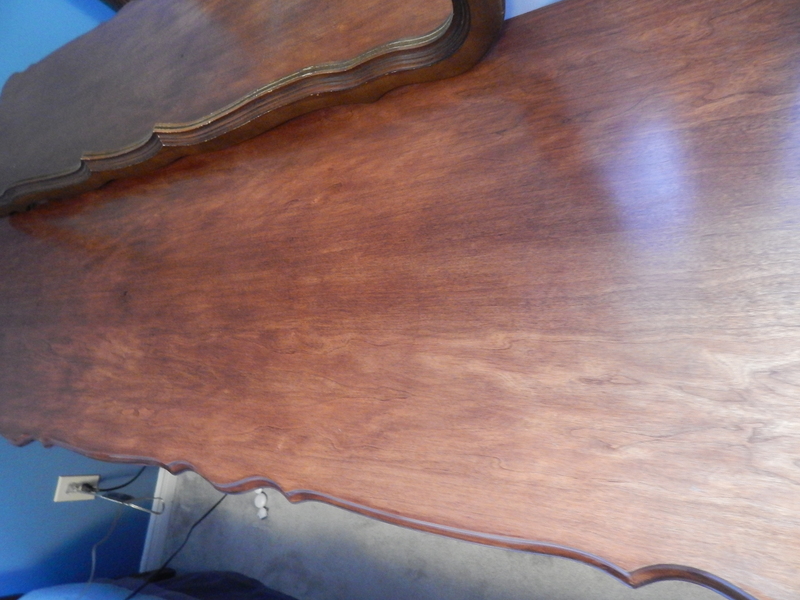 Leave as is or sand down to bare wood and redo the whole table. Option 1 was a definite no. There was no way I could hand this back to her in this condition. I asked myself would I use this table the way it looked in my own home? Absolutely not…so I sanded. And sanded. And sanded. 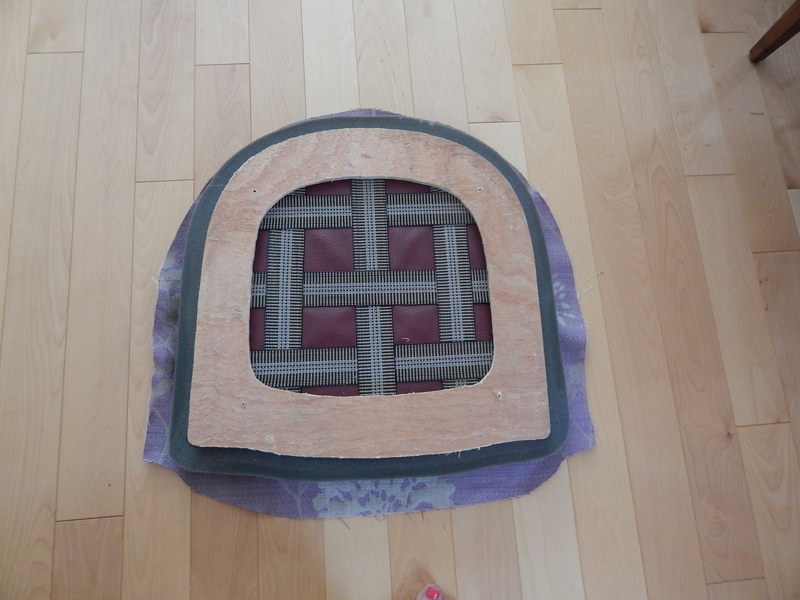 I was afraid that the top layer was actually veneer and worried I might strip off too much. Here it is during the sanding process. Looking much better. The spots are disappearing. Went on to apply about 4 or 5 coats of stain and top coat. Here’s the finished project. I love how it turned out and absolutely adore the new chairs she picked out. Check out her flooring too! It’s pretty cool. On a side note, I worked on this in October and while it had been fairly warm, I was applying the top coat on the table during a bit of a cold spell. 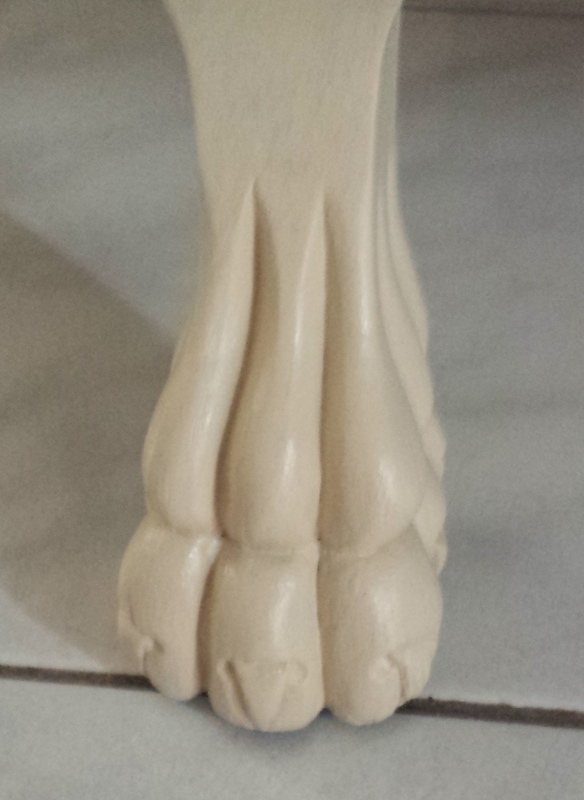 I noticed a bit of a cloudy appearance in some spots from the top coat. I know that this is from temperature change so if it’s not looking the best, I’ll go back in the spring and touch that part up if necessary. Happy National Thrift Store Day! Heading out later to see if there’s anything good left. For now, here’s this. If you read my last post, you may have gotten the hint that we are in the middle of a complete kitchen transformation, DIY-style. One of the things we knew we wanted was to replace our oak island with something old. 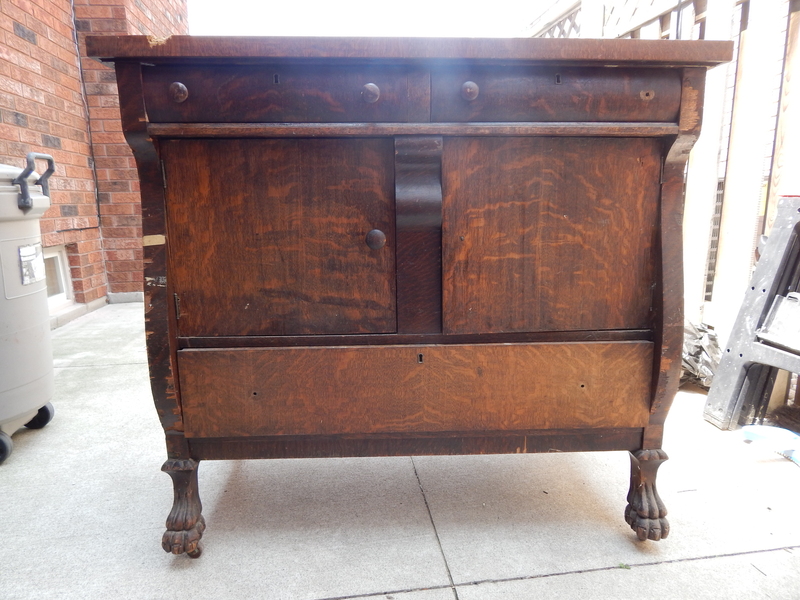 Found this quarter-sawn tiger oak sideboard from the early 1900s. Man, was it in pretty rough shape. You can see a lot of the tiger oak veneer is peeling and there’s a big chunk taken out of the top. 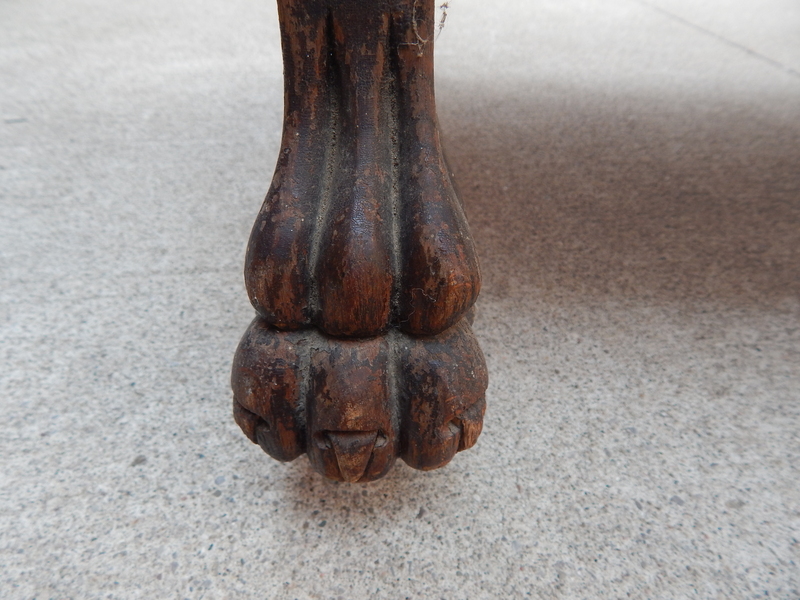 But look at those claw feet! Gorgeous! Here’s a picture of our kitchen taken a few years ago but this is pretty much what it’s been looking like. 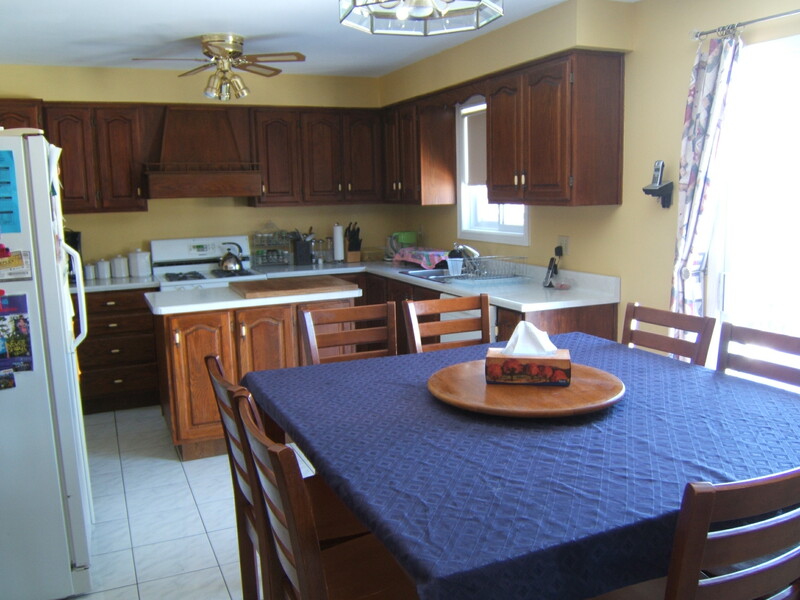 You can see the island here and the oak cabinets. As for the yellow paint, I did this a few years ago. Not sure what possessed me as I am not a fan of yellow. Suffice it to say, I was reading about feng shui and got caught up in the whole (what I deem as ridiculous now-sorry if I offend) notion that colour affects what happens in your life and in your home. I am so anti-new age anything now. If you’re wondering what happened to the old island, we posted an ad and had several responses to this free giveaway. It went to a good new home! We had a plan to find something old and paint it but when we saw this piece and Mr. Restyle sanded it and removed the veneer that absolutely had to be removed, we both felt bad about the idea of painting it. So what did we do? We stained it. And then we both hated it. Back to our original idea. I’ve done this before where I’ve had doubts. Don’t do this. Go with your gut! 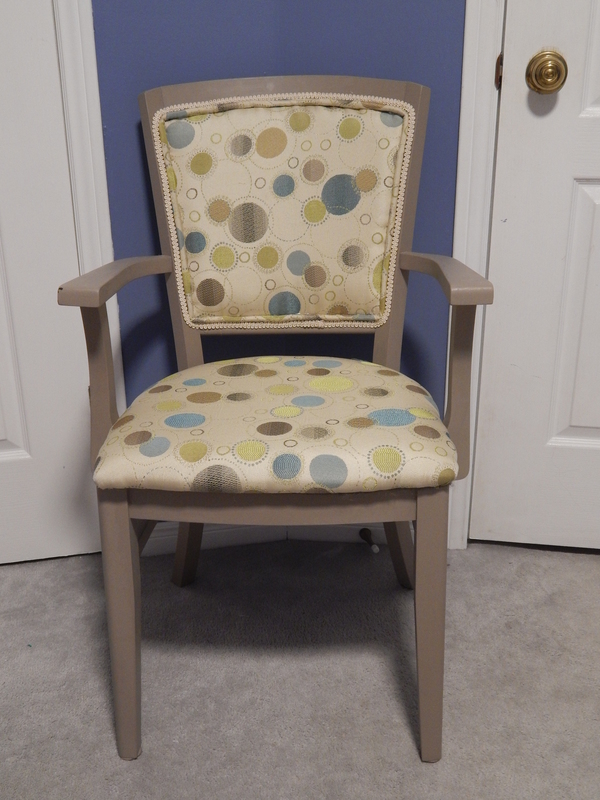 We painted it with ASCP in Old Ochre but stained the top with General Finishes Java Gel Stain. Mr. Restyle used a router saw to fix the top piece where a good chunk was missing. So clever! You can barely tell now. Sealed the whole thing with the satin top coat also from General Finishes. New knobs were added still in keeping with the original look. I love our new island and I am sure it will serve us well for years to come. Here’s another look at the before and after. My girl and my older son both needed chairs for their bedrooms. Just a chair to hang clothes on. Like most teenagers, they spend most of their time propped up on their beds with all their various devices spread out around them. 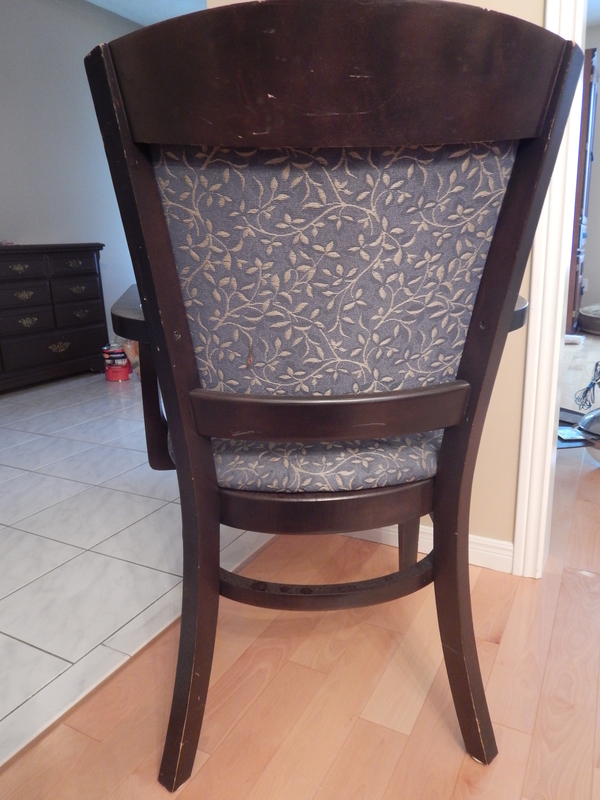 I picked up 2 identical chairs from Mr. Used in Hamilton. For those familiar with the city, you may have heard of this humungous warehouse of all things weird and wonderful. Mr. Used was clearing out his 70,000 square foot collection back in March in order to downsize and move to a new, smaller space. Check out a past article here if you live in the area. I don’t know if he’s moved yet or how much he’s downsized. This is a long post which includes a detailed tutorial, so if you want to skip that part, just scroll on down to the end to see the transformation! 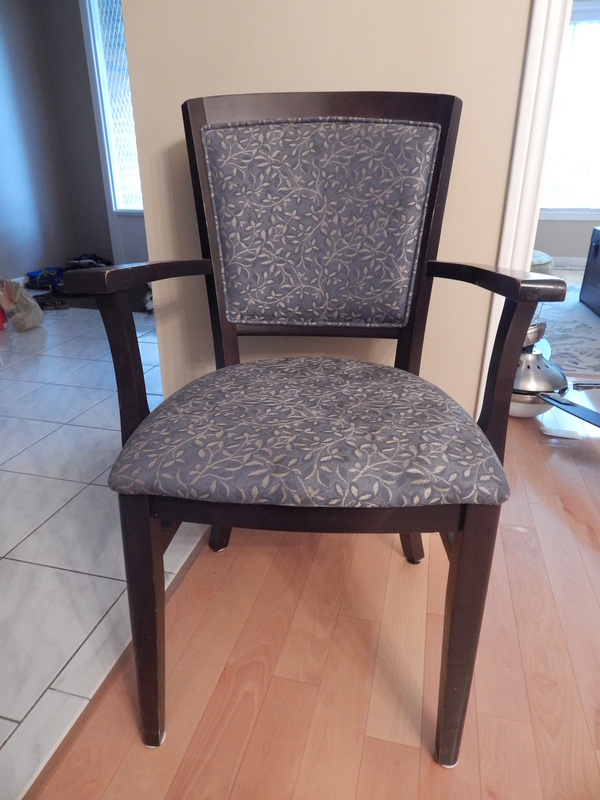 These grimy chairs I got at Mr. Used came from Wentworth Lodge, a nursing home in the city. 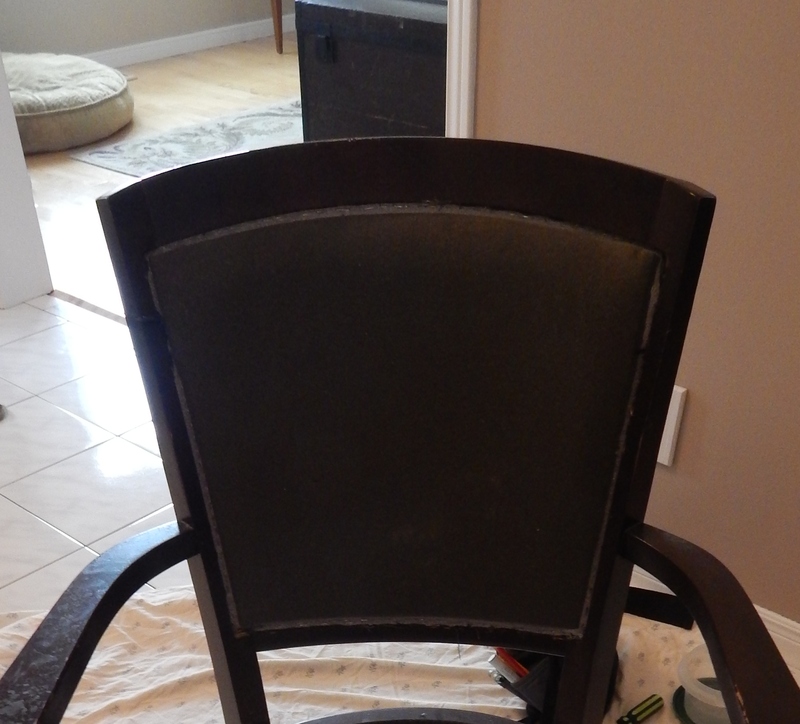 Old Chair about to get a new look. You may not be able to see the dirt but trust me it’s there. Yuck! 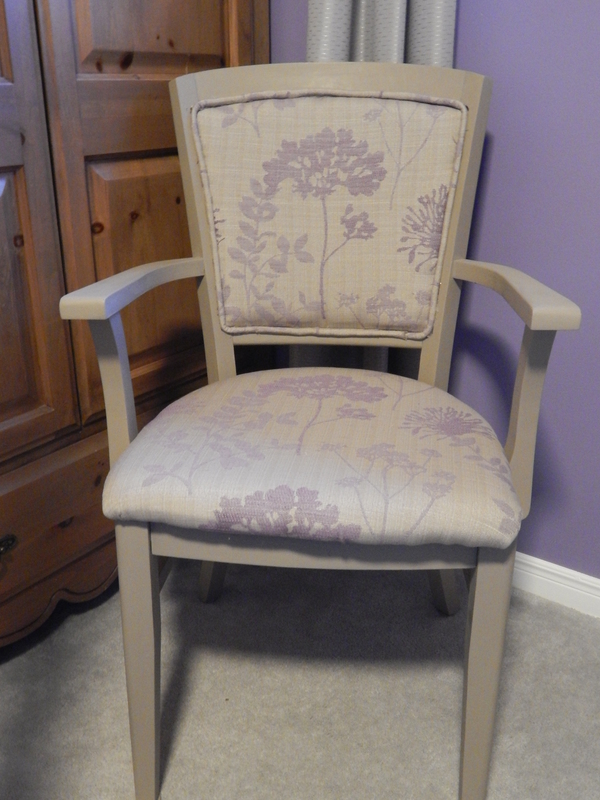 I would be painting these with the leftover chalk paint I had from the Not So Pretty in Pink fabric painted chair. There is no need to sand or prime when using chalk paint. All I did was wipe these bad boys down with water and vinegar. You could use soap and water. I use white vinegar on a lot of my thrifted pieces (even clothing) to get rid of stinkies. It is a good idea to take pictures as you go, so you can put things back in the proper way. Trust me, you will NOT remember later. As you remove the fabric pieces, try not to rip them as you will need them to make a pattern for your new fabric. Step 1. 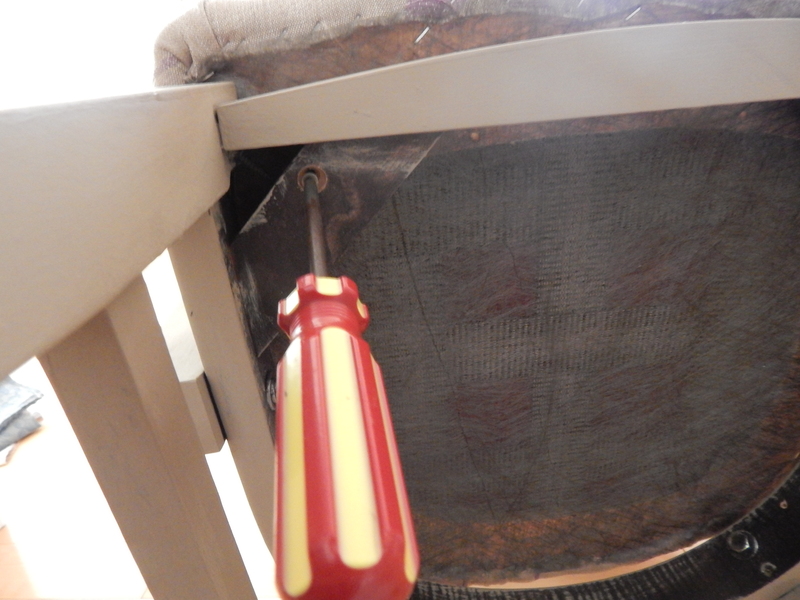 Remove all the screws holding the chair pad in place. Remove screws from bottom and put them away in a jar for later. Step 2. Remove staples holding fabric and foam in place. I strongly advise you to get one of these tools. Do not even try to use the staple removers that are designed for removing paper staples and don’t, I mean, DON’T try to use a screwdriver! You will bang, scrape, cut your way to a pair of miserable hands! Invest in one of these tools for staple removal. Step 3. If there is any piping, it is most likely glued on, remove it but try to keep the piping intact so it doesn’t rip. 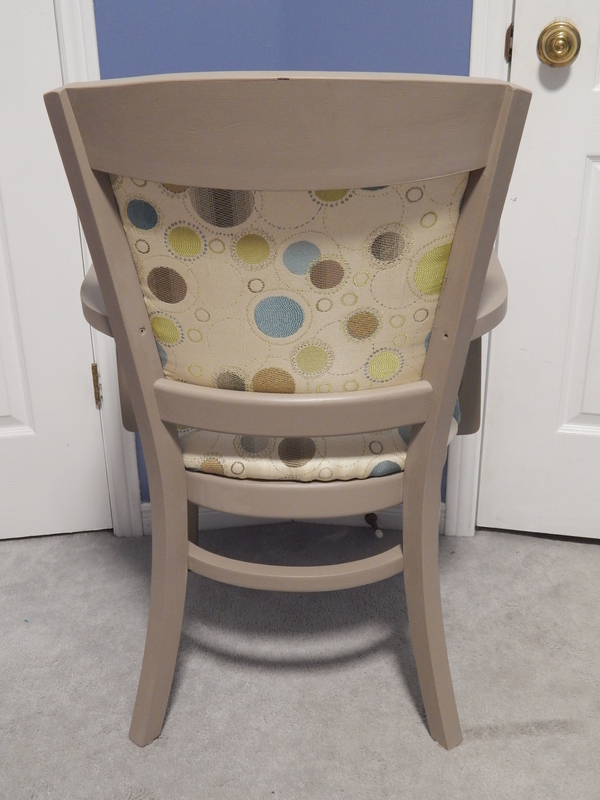 I reused the piping for my chairs. Otherwise, you can purchase some and just recover with your fabric of choice. My piping was in good condition. Step 4. This is the most time consuming, frustrating part-removing all the staples. There will be a lot of them, and I do mean a lot! they will be tucked way in there. 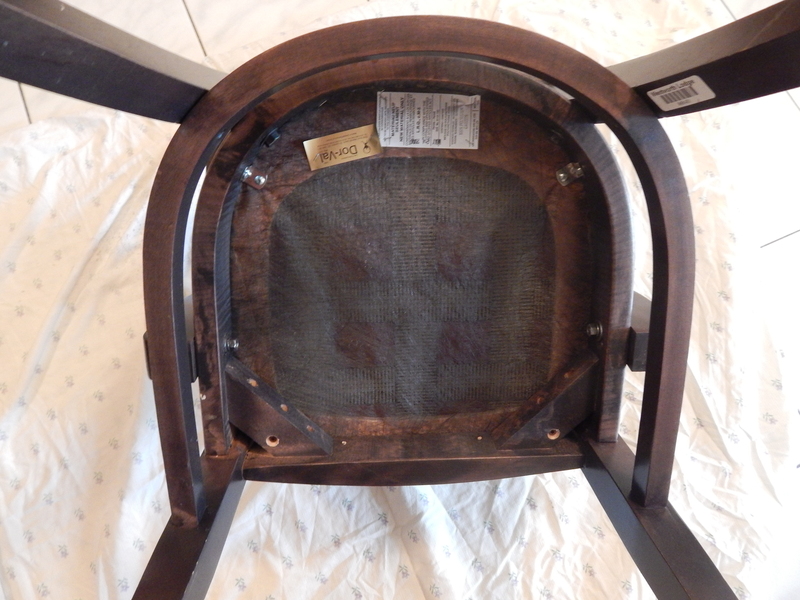 The trick is to try not to damage the wood of the chair frame. Oh the joys of removing a gazillion staples! Step 5. Once you’ve taken the front cover off, there will be a piece of foam which may or may not be stapled to the frame. Mine wasn’t. Remove it. Remove the foam back from the chair. 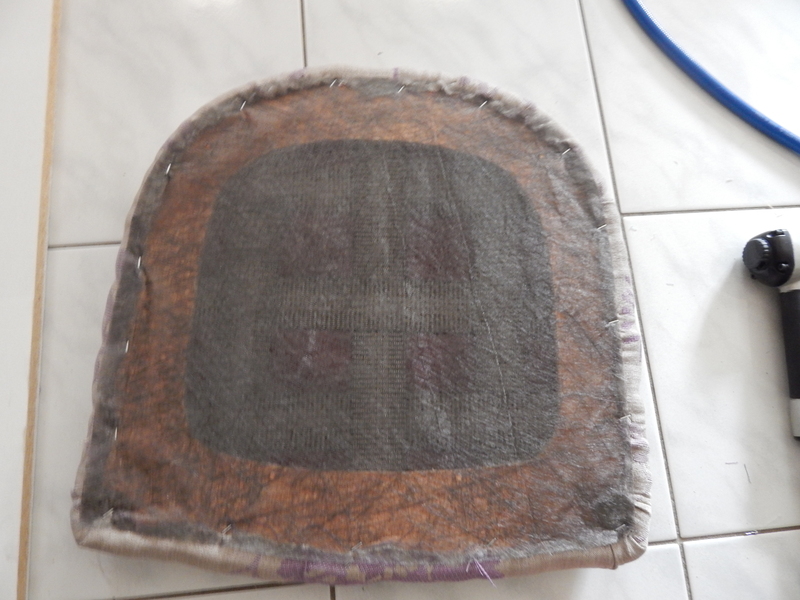 After the back rest cover is removed. Outside back fabric to be removed. Step 6. 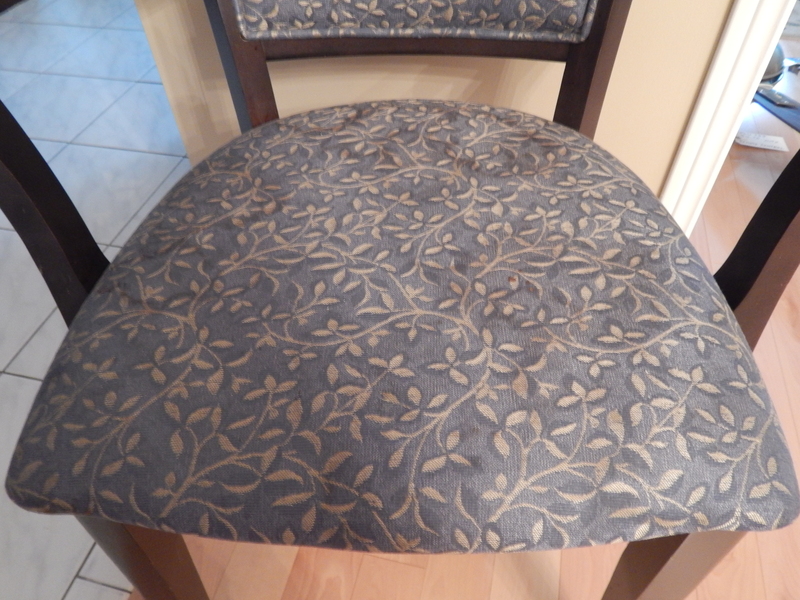 Remove the fabric cover from the seat, again being careful not to damage it so you can reuse it. If you prefer, go ahead and use new fabric but what I do (if it’s in good shape) is I reuse it BUT I wash it first by hand using plain old laundry detergent and I hang it outside to dry. Sunlight is a great disinfectant. 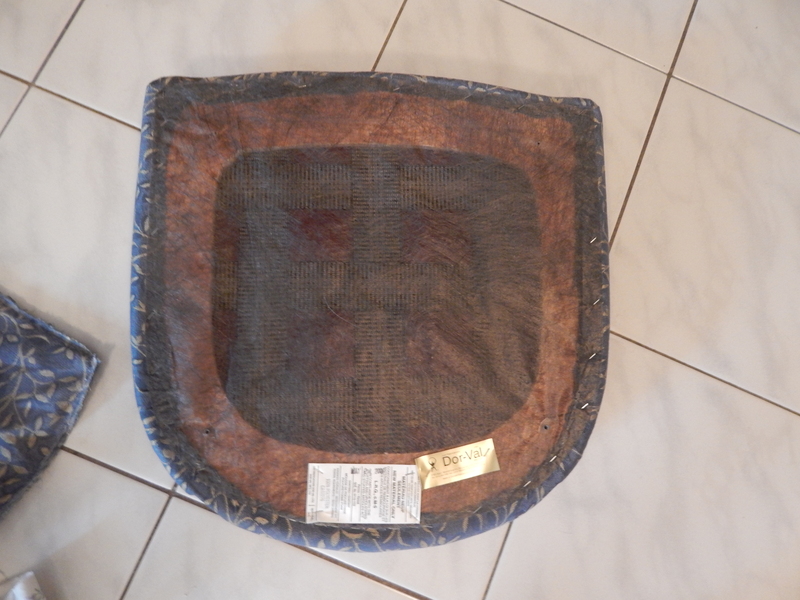 Remove dust cover from seat pad. Step 7. Surprise! More staples! Guess what, remove those too. I forgot to mention when using that tool thingy up above that looks like a modified screwdriver-sometimes it won’t get under the staple. Use a hammer and give it a couple of whacks. That should get the tool under there to lift the staple. You can always use a pair of pliers to pull the staples out if they don’t come out in one go. A staple-removing journey that never ends. Step 8. Get someone else to finish the job. Just kidding! You can do this! But go ahead, take a break. You need it after all that! Looking so much better already! Step 9. Paint. 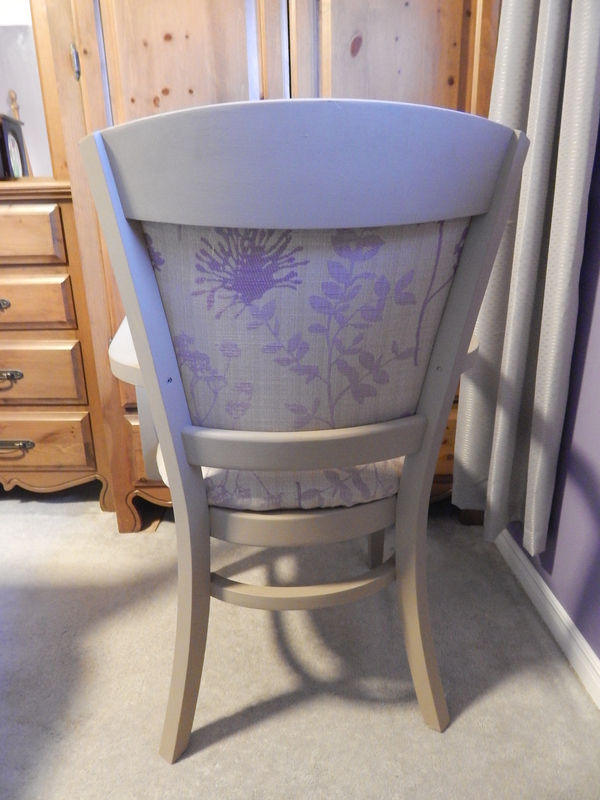 I used 3 coats of Annie Sloan chalk paint and then used the Annie Sloan soft wax (2 coats). 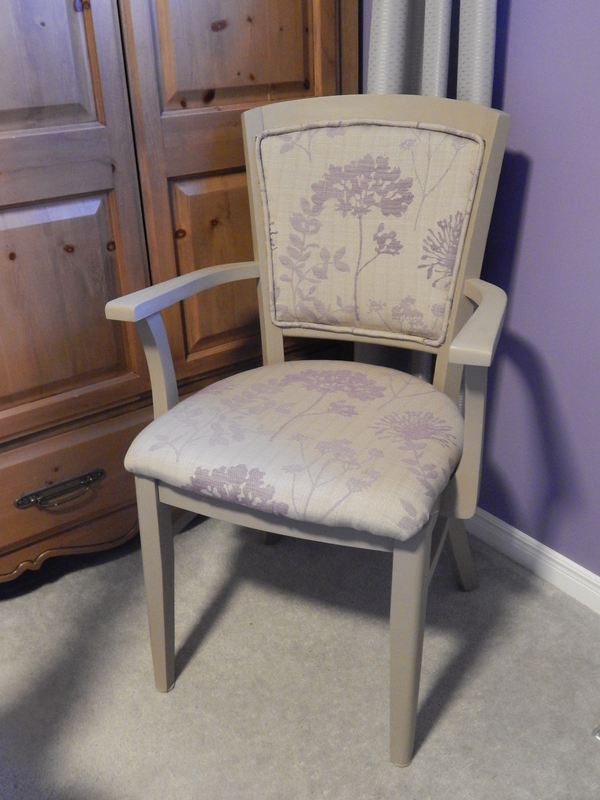 You can read about both these products in my other post (above-the Not So Pretty in Pink Chair). I totally forgot to take pics of the painting process. You can use whatever paint/primer you want. Chalk paint is just so much easier and I had leftovers so that’s what I did. Step 10. Next, you’ll want to lay the fabric pieces you just removed on top of your new fabric as a pattern and cut out the new sections. A word of advice here. I found as I started to put the chairs together that I wished the original pieces I had removed were just a little bit bigger. 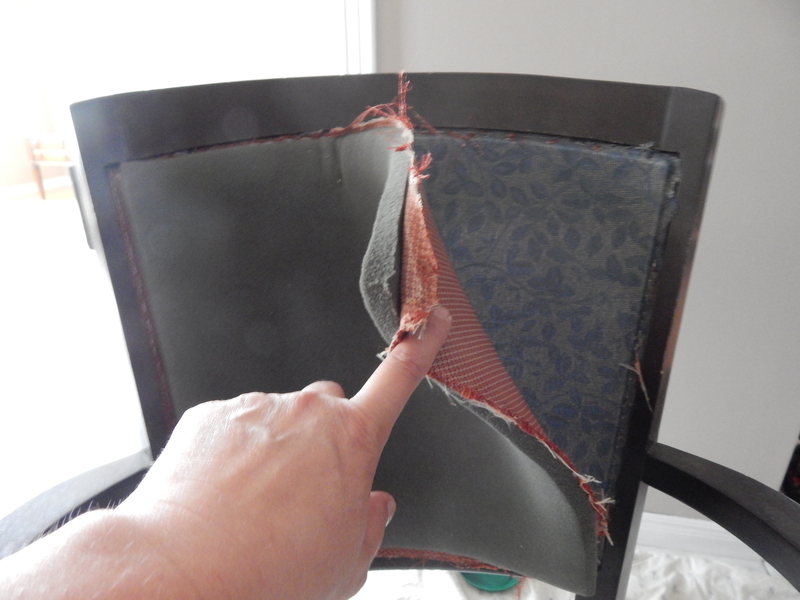 I don’t know if they trim the excess after they staple onto the chair but I found I had to pull quite a bit. The next time I do this I will definitely leave an extra inch or two all around. 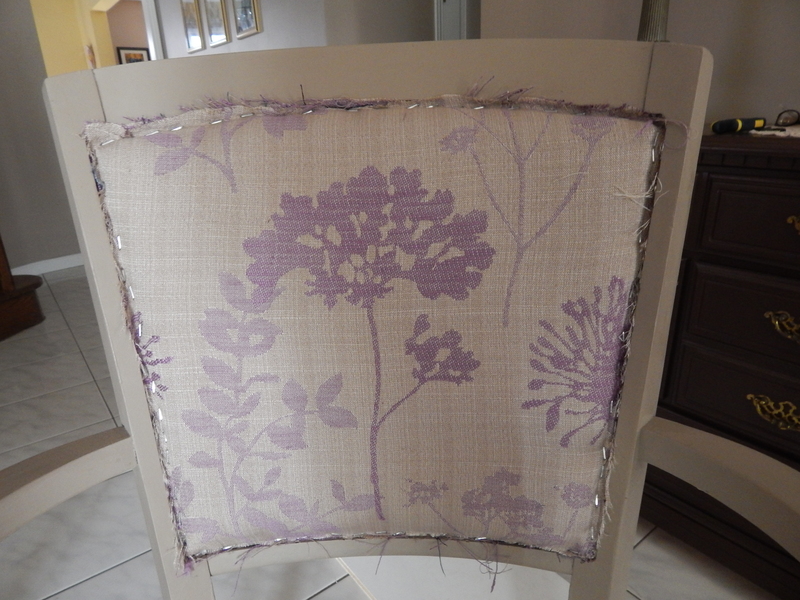 Another cautionary note if you are using a fabric that has a definite repeat (like the grey/purple chair I did here down below). I wanted the flowers to be in the middle. Make sure you buy enough fabric to allow for fabric repeat/placement of pattern, etc. You’ll see what I mean as you see the chair. If you plan on doing many projects like this you might think about investing in an air compressor with a stapler. Heavy duty staplers are just okay in my opinion. They still require a lot of muscle and force. I found that I was just not strong enough to drive the staples down far enough. Mr. Restyle bought the air compressor to do some baseboards (or so he says-he hasn’t used it yet). I know he bought it for moi! 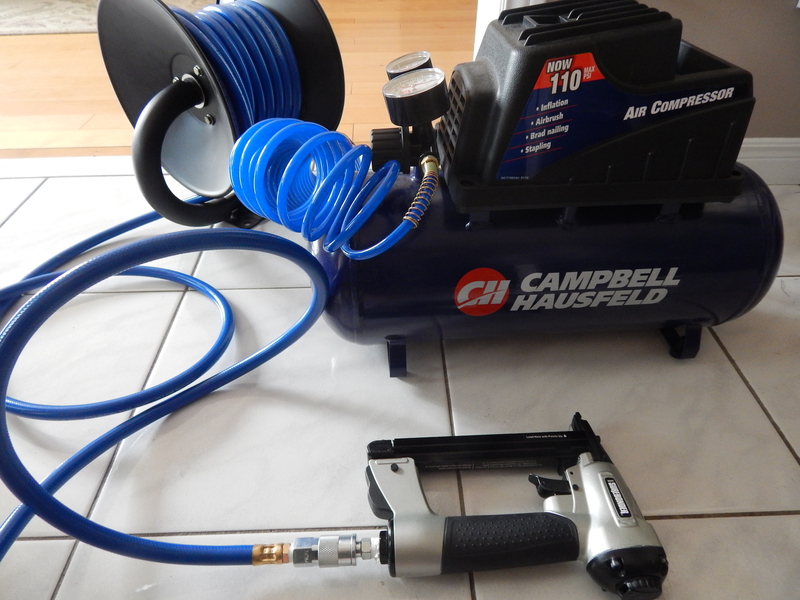 Air compressor with stapler attachment. Don’t be alarmed by how noisy this thing is when it first starts filling with air. The noise lasts for a few minutes and then you can just staple away! Step 11. Begin with the outside back. Remember that this fabric will be stapled right side facing out. 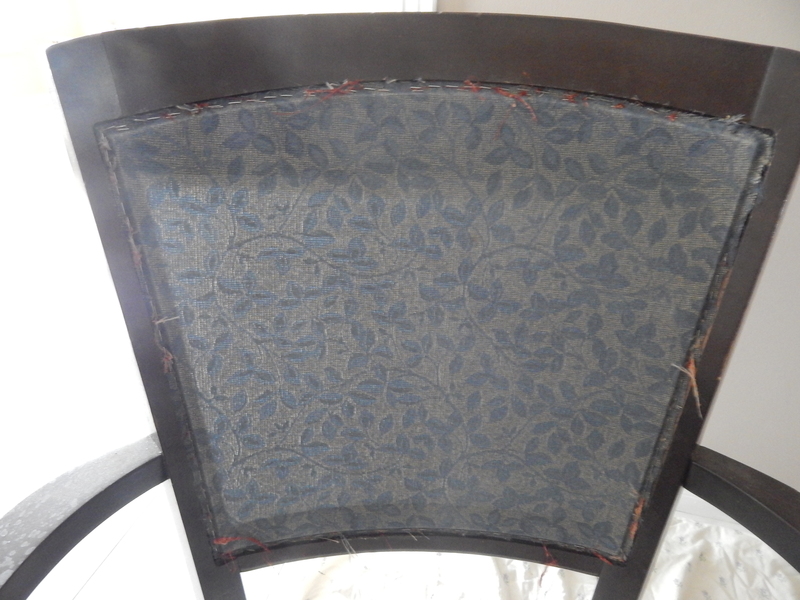 Staple outside back fabric to chair frame. Step 12. For this next step, I had already washed all of the foam (it was in great shape just needed some cleaning) in laundry detergent and air dried it all outside (remember the sun as a disinfectant). Just because something is thrifted does not mean it has to be dirty. I am a clean freak so this is important to me. 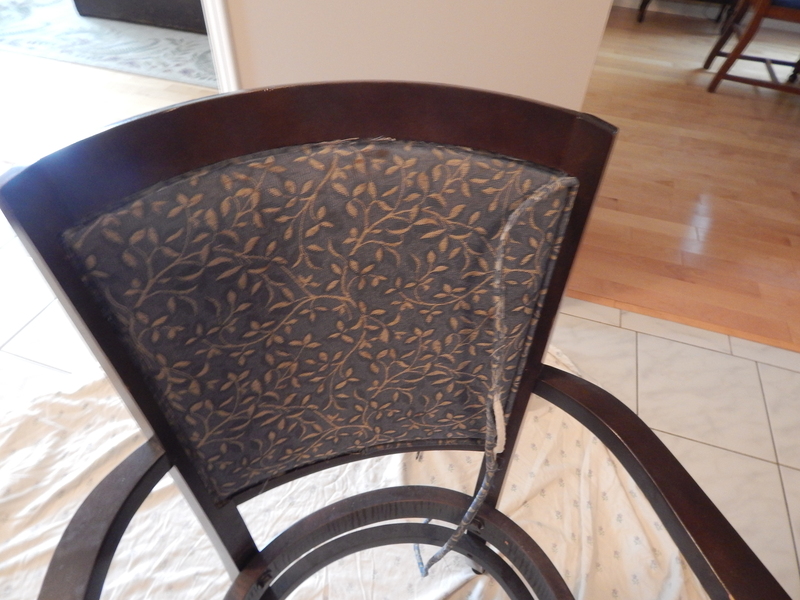 Lay the chair back piece over the foam. You can see here what I mean by fabric repeats. This fabric has a definite big print (the big floral). I wanted this to be in the middle of the chair back and the chair seat. I did not care about it being matchy poo on the outside back. 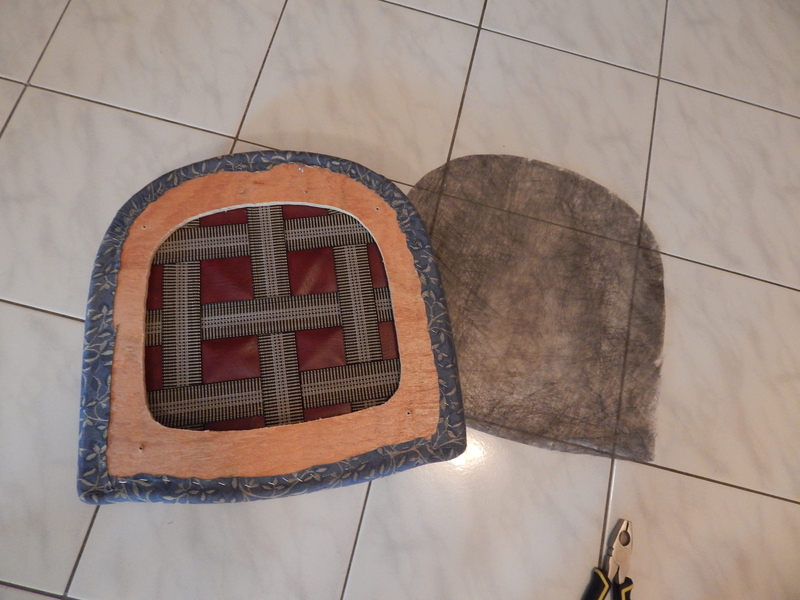 Lay inside back fabric over foam. Step 13. Staple to frame. I didn’t staple the foam. It would be held in place by the cover. Step 14. Centre the seat fabric over the seat and staple. I start by placing a staple in the middle of all 4 sides and then work out. I don’t know if this is the proper method but it’s what I do. Again here I wish the piece was a bit bigger so I didn’t have to pull so tight. I ended up with some bumps which could’ve been avoided. 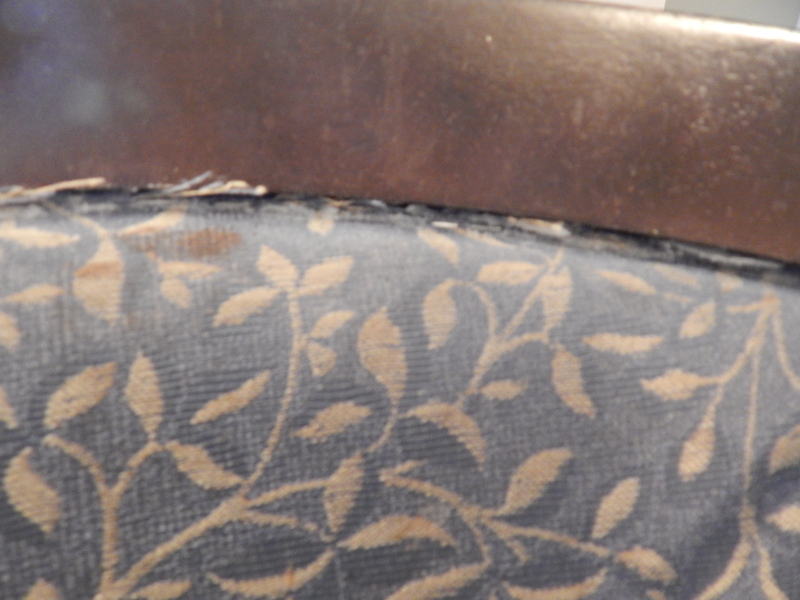 Stapling fabric to the seat. Step 15. Staple the dust cover on. Staple dust cover back on. Step 16. Attach seat to frame using screws you set aside earlier. Screwing the seat onto the frame. Step 17. I forgot to photograph this part but you will need to make new piping. 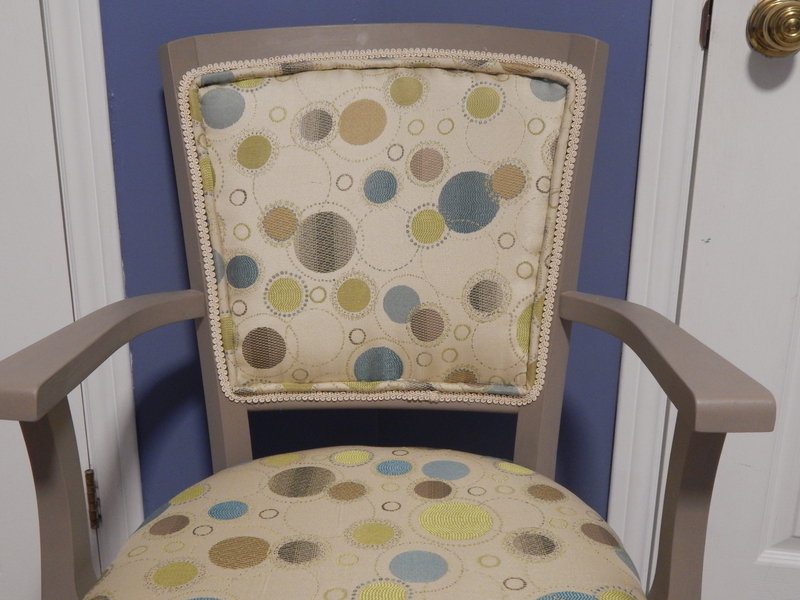 I used the piping that was on the chairs. All I did was remove the old fabric from the existing piping. I then cut a new piece of fabric to match the length of the piping. I cut the new piece quite a bit wider. I find it easier to sew piping when the machine has some fabric to grab onto as it sews. You can always trim it later. 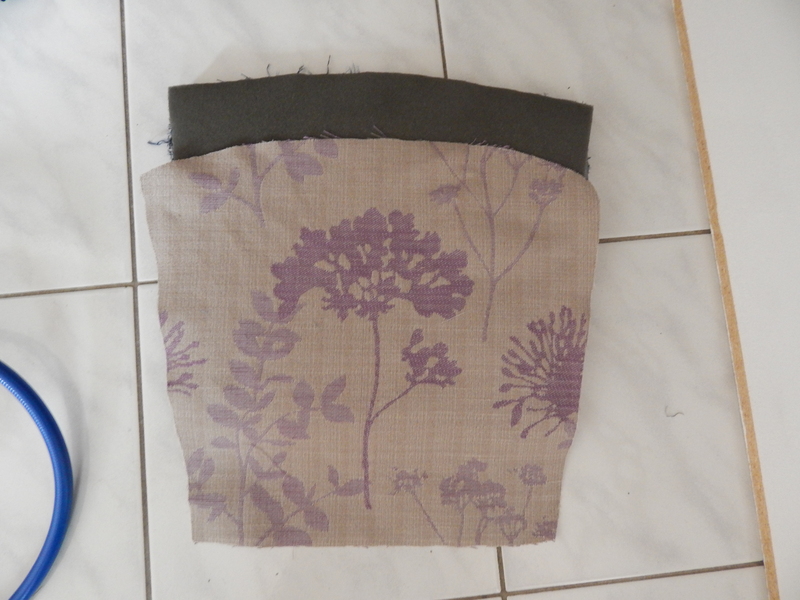 I folded the new fabric over the piping and used a zipper foot to sew as close as possible to the piping. I then trimmed the excess fabric off being careful not to snip too close to the stitching. Step 18. 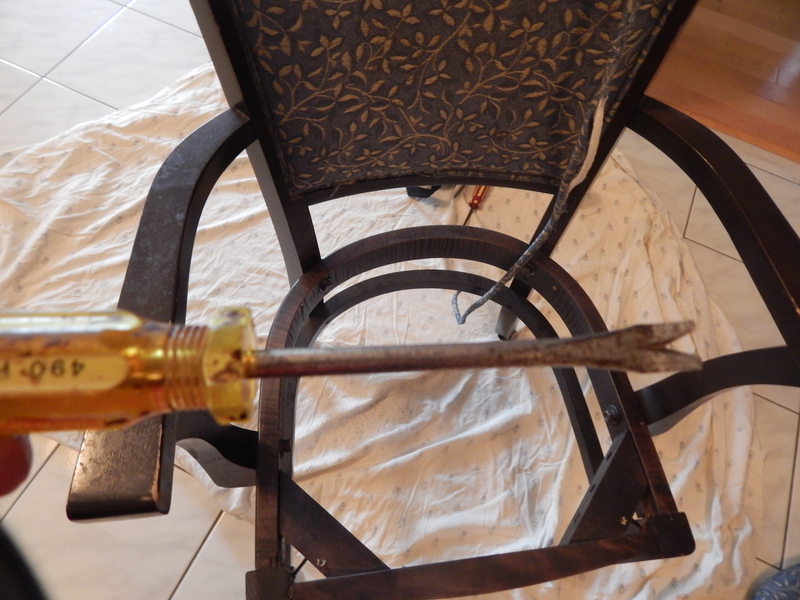 Use a hot glue gun to attach the piping to the chair back. 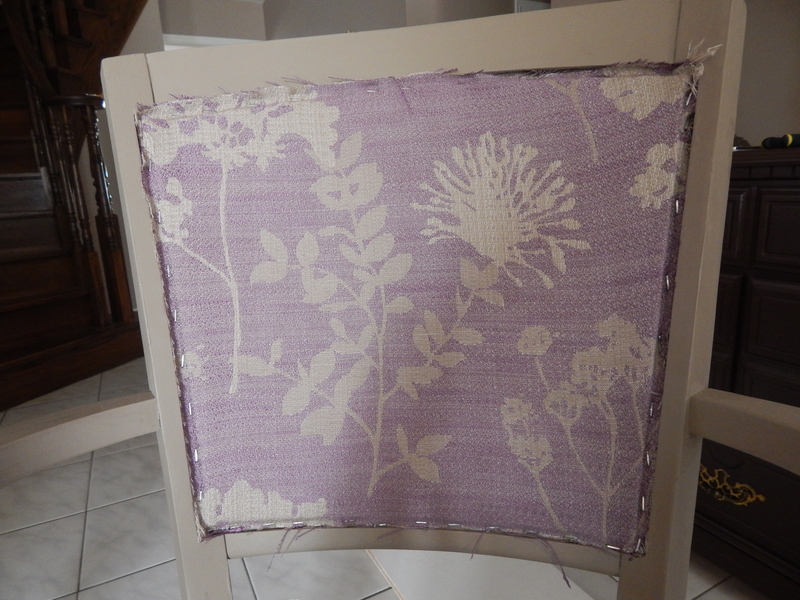 Here is my daughter’s chair all done. And here’s my son’s chair. I actually did this one first but did not plan on a tutorial. I had a lot of excess fabric sticking out even after I attached the piping. I needed to cover it up so I just hot glued some trim I had. Not the best solution but I kind of like it for now. This is not that difficult to do. You can do it yourself! 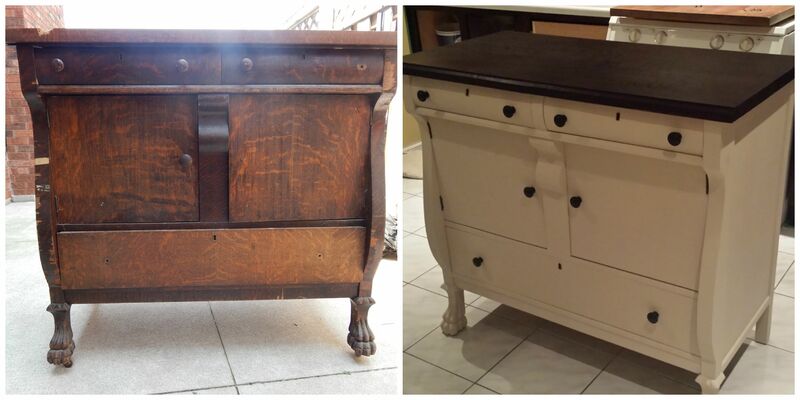 I recently refinished this dresser (see Refashion of a Different Kind) and wanted to showcase the result. 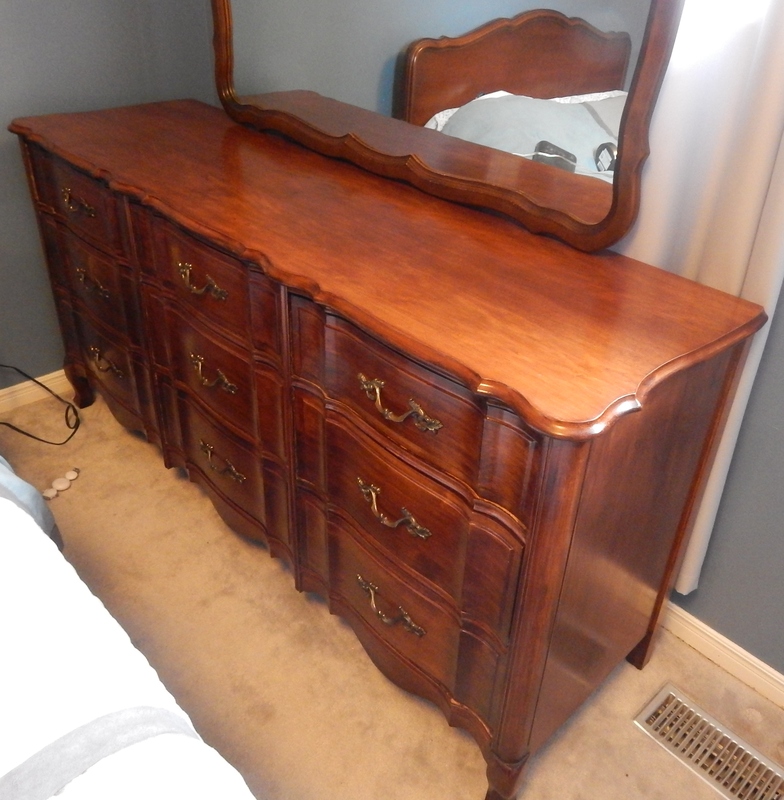 Dresser AFTER-the beautiful cherry wood grain really pops. This was a LOT of work but worth every minute. I LOVE beautiful wood. Some people might paint this stuff but I always like to salvage a really good piece first. I opted to leave the original hardware on it. Antiques depreciate in value if they don’t have the original hardware. You can see the matching bed in this picture. I didn’t do anything to it. It was in GREAT condition. I am so happy with this. Now I have to finish off the night stands and the tallboy dresser. Still a lot of work to do! Well, this was not the way I wanted to start a refashion/sewing/thrifting blog. I had hoped to be up and running on a regular basis by now but I have good reason! 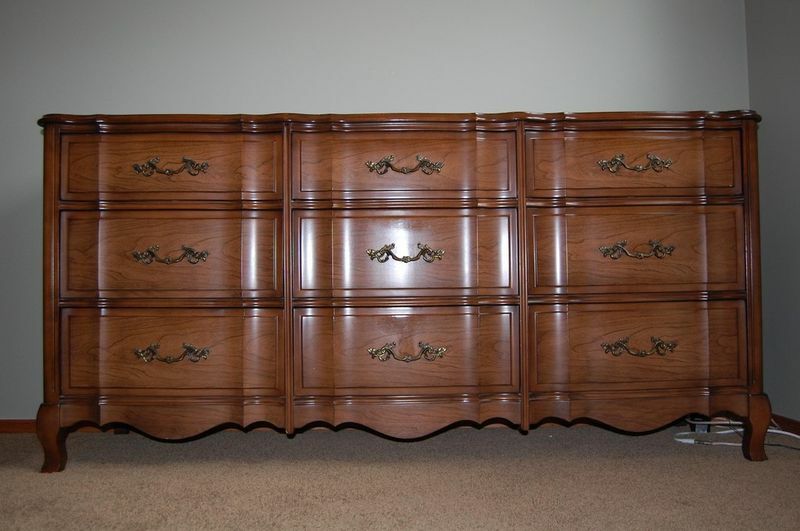 I have been looking for a bedroom suite for a very long time and I’ve just not been finding anything in the stores that is worth the money on the price tags. It all looks so incredibly cheap and poorly made. I guess we really do live in a disposable world. Oh sure, it all looks beautiful when it’s brand new but there’s something about plunking down several hundreds of dollars on some particle board/plywood/veneer/fake wood or whatever this stuff is made of, especially if it’s going to be for a teenage boy and knowing my kid-well, let’s just say he’s not the most gentle of creatures. I just didn’t see it lasting very long. So, I found this beautiful solid cherrywood suite online and although it’s not young and hip and modern, it will last a lifetime and he actually LIKES it! I got if for a really good deal. 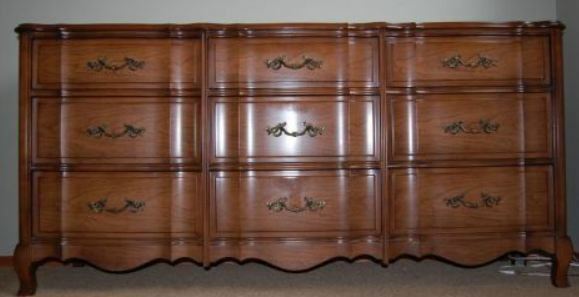 The only problem is, the lady who sold it to me had the tops of the dressers covered in doilies and of course, I didn’t check but there are some nicks and scratches and water stains on them. The good news is that it’s genuine solid wood and constructed with dovetail joints. I know the manufacturer (Andrew Malcolm, who was quite well known quite a few years ago) and since the seller had lived in her house for 55 years, I knew it would last in mine. I originally wanted to just lightly remove whatever varnish was on it and stain it a darker colour because I didn’t like the colour as it stood. 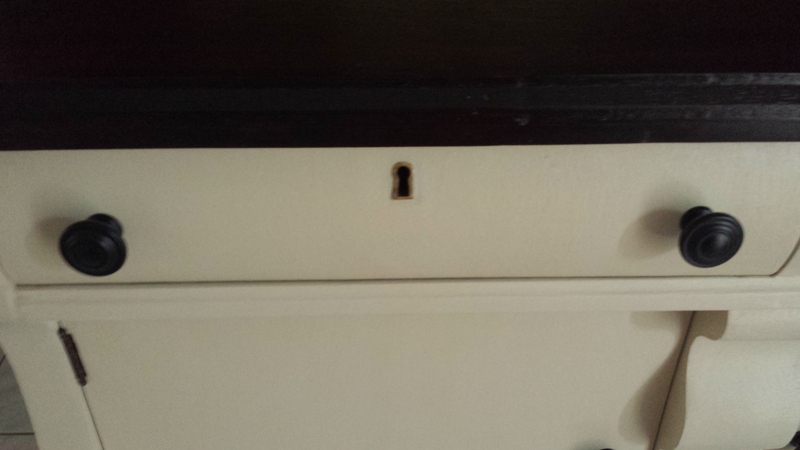 I had done this on my oak kitchen cupboards without any issue. This is where I ran into a problem as finishes from 40, 50 years ago are not polyurethane but rather shellac, lacquer or something similar, therefore the stain did not penetrate and just beaded up-argh!!! 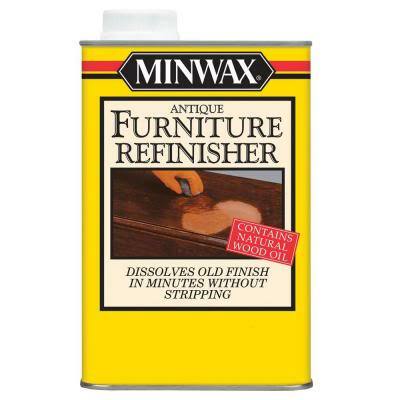 I found a product from Minwax called Antique Furniture Refinisher that claims to remove old finishes without stripping or sanding. Fantastic! Note, that if you’re going to do this yourself, this particular Minwax product does NOT remove polyurethane. For that you’ll have to use a different product. Well, this is what I’ve been doing instead of sewing, thrifting and refashioning but I hope to be up and running soon. In the meantime, this project is going to take a lot of my time. 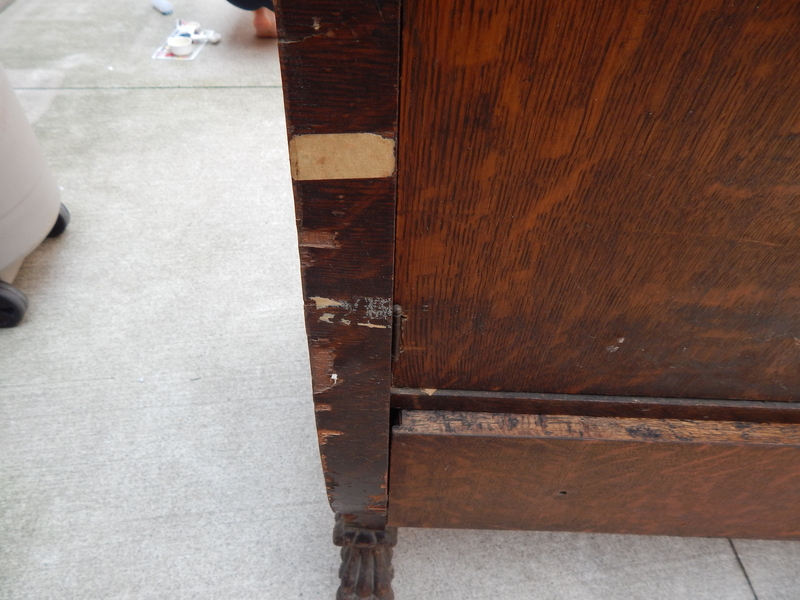 So far, I’ve removed part of the top of one dresser and I was astonished to see the beautiful cherrywood underneath. I read that cherrywood does not really need staining. In fact, I can see that a simple clear coat protectant of some sort will really let the natural beauty of the wood show through. I’m so excited to get this done. I’ll post pics of the project when I’m further along.